Product prices and availability are accurate as of 2019-04-14 00:41:14 UTC and are subject to change. Any price and availability information displayed on http://www.amazon.com/ at the time of purchase will apply to the purchase of this product. 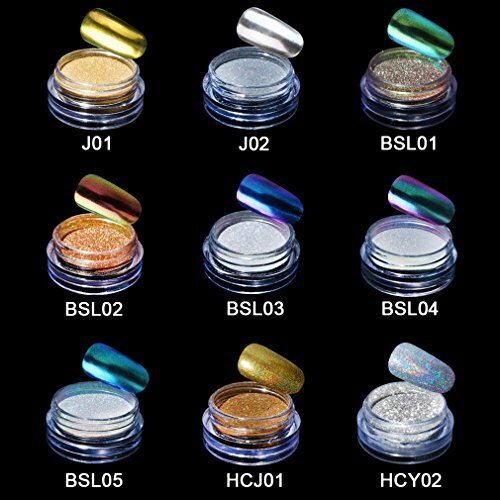 With this powder, you will change a normal nail into a magic mirror chrome effect. Fine and smooth powder, light weight but durable! Black is best for the full mirror effect but a color base can make it do cool things. Each box comes with a sponge stick for easy operation. Only no clean top coat can get mirror effect. 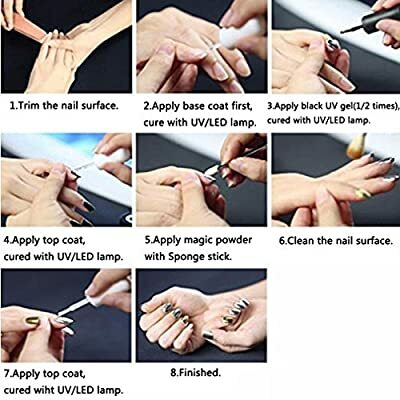 Great for home and professional use, can be used on natural or false nail tips.You can also use them to decorate your home, cell phone's case, glasses, made card, body art, etc. Warm Tips: the actual colors may be slightly different from the picture because of the lighting and computer color. Step 1. Apply base coat first. Cure under a UV light for 1 minute or an LED light for 30 seconds. Step 2. Apply basic color gel polish (any color is OK, black color is better ), cure with UV lamp for 2-3 minutes or cure with LED lamp for 60 seconds. Step 3. Apply the no clean top coat. Cure under a UV light for only 10 seconds (Important). Step 5. Seal it with no clean top coat. Cure under a UV light for 1 minute or an LED light for 30 seconds. With this powder, you will change a normal nail into a magic mirror chrome effect. 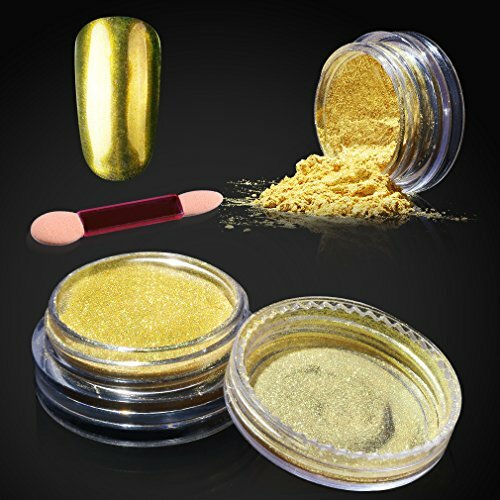 Package: 1 x 1g Gold Chrome Powder, 1 x Sponge Stick Fine and smooth powder, light weight but durable! Black is best for the full mirror effect but a color base can make it do cool things. Each box comes with a sponge stick for easy operation. Only no clean top coat can get mirror effect.